And so the perpetual battle rages on: Stuffing vs. Dressing. Which is it? The customary side dish to the Thanksgiving Turkey really can be either; depending from where you hail. Most folks from the Northern states call it stuffing. The Southern states call it dressing. And those in the Midwest and Western states pretty much just go along with what it was traditionally called down through the generations. But regardless of where you’re from and whichever you call it, the traditional Turkey Sidekick is almost always a savory recipe prepared with seasoned bread croutons or cornbread and mixed with vegetables such as carrots, onions and celery. Depending on where you are, nuts, dried fruits and herbs also make an appearance. So why call it stuffing or dressing? Who still stuffs the turkey, anyway? Is it called dressing if it’s not stuffed inside? Why do we make a dressing and stuff it inside a turkey, which then becomes a stuffing for the turkey? Can I make a stuffing without stuffing it into the bird? Or would that be called dressing? But didn’t you just ask if the dressing BECOMES the stuffing? WHY IS THIS SO COMPLICATED? We call it stuffing (but for those of you who want to think of it as dressing, be our guest) and bake it in a dish to serve with the turkey. We do not serve anything that’s been stuffed inside a turkey. Stuffing a turkey with stuffing/dressing increases the turkey’s cooking time — which might lead to over-cooking the bird (have you ever choked on dry breast meat?) or undercooking the center. Either way, over-cooked turkey or salmonella-laced stuffing/dressing are two avenues we’d rather avoid this holiday. Try our cornbread stuffing. 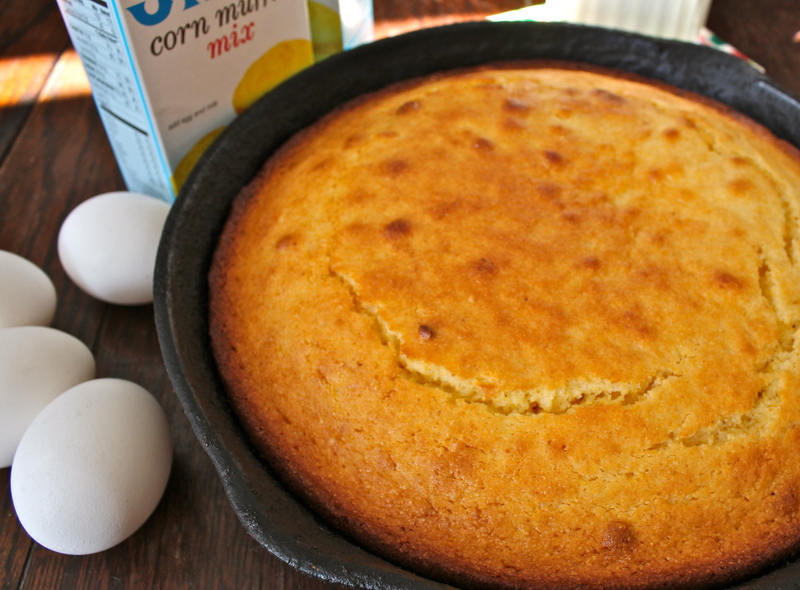 Make the cornbread in a jiffy, using the famous blue and white box! 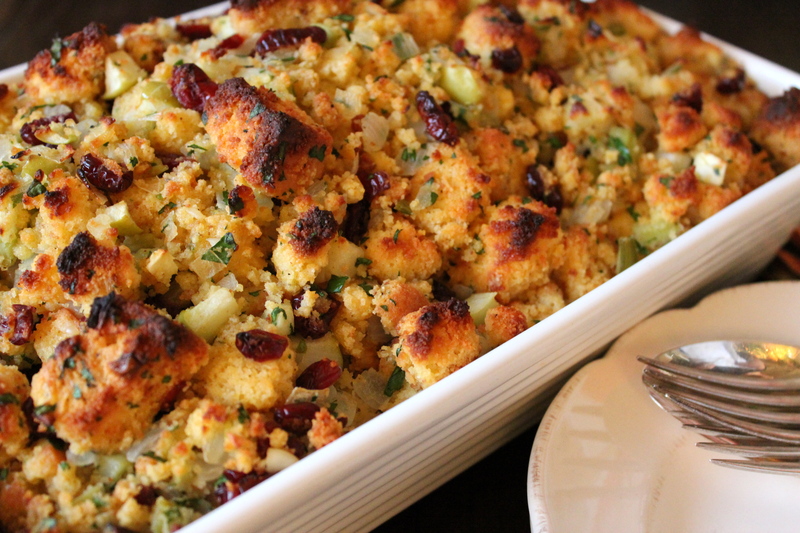 This heart-warming, food-coma-inducing stuffing recipe is a hands-down winner in our recipe box. The toasty fennel seeds add a spicy sweetness that the tart apple and dried cranberries pick up. Make sure to make extras – there are almost no leftovers from just one dish. In a small skillet over medium-low heat, toast the fennel seeds until they are warm and fragrant, about three minutes. Set aside to cool. Preheat oven to 350°F. Butter the inside of a 13×9-inch gratin dish with 1 tablespoon butter and set aside. In a large sauté pan, heat 3 tablespoons of butter and sauté the onions over medium heat until translucent, about 7 minutes. Stir in the garlic, celery, apple and fennel seeds and cook an additional 5 minutes. Remove pan from heat and set aside to cool. Toss the vegetable mixture with the cornbread, parsley and cranberries in a large bowl. Season stuffing with salt and pepper. Taste and adjust seasoning to taste as necessary. Stir in the eggs. Add as much stock as needed to moisten the stuffing but not make it soggy (you may not need all of the stock). Place stuffing in prepared gratin dish and dot with the remaining 2 tablespoons of butter on the top. Cover the casserole with foil and bake for 45 minutes or until warmed through. Remove foil and continue baking an additional 5 to 10 minutes until top of stuffing is golden brown. To Make Stuffing Ahead: Bake cornbread 2 days before Thanksgiving. Assemble stuffing the day before in the baking dish, then wrapped tightly in plastic wrap and refrigerated for up to 24 hours before baking. To bake, remove stuffing from the refrigerator 30 minutes before baking. Cover the casserole with foil and bake for 45 minutes or until warm through. Remove foil and continue baking an additional 5 to 10 minutes until top of stuffing is golden brown.